The funeral director is paid from the fee charged by the funeral home. This fee typically runs several thousand dollars or more and includes things like the cost of transportation, casket, embalming, facility use, and more. 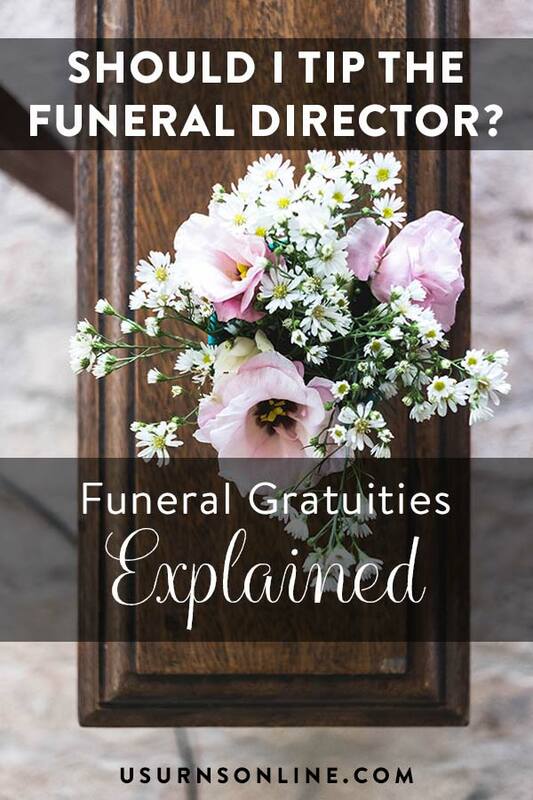 Traditionally, funeral directors are not tipped in addition to this, and most will not expect a gratuity. Funeral home staff, like the funeral director, are paid out of the bill you will receive from the funeral home and do not typically receive a gratuity. But when an individual or the staff as a whole is extremely helpful and conscientious, it is entirely appropriate to recognize their kind service with a small thank-you gift. For an individual, you may consider a thank-you note with a gift card inside, or perhaps a small thoughtful gift. 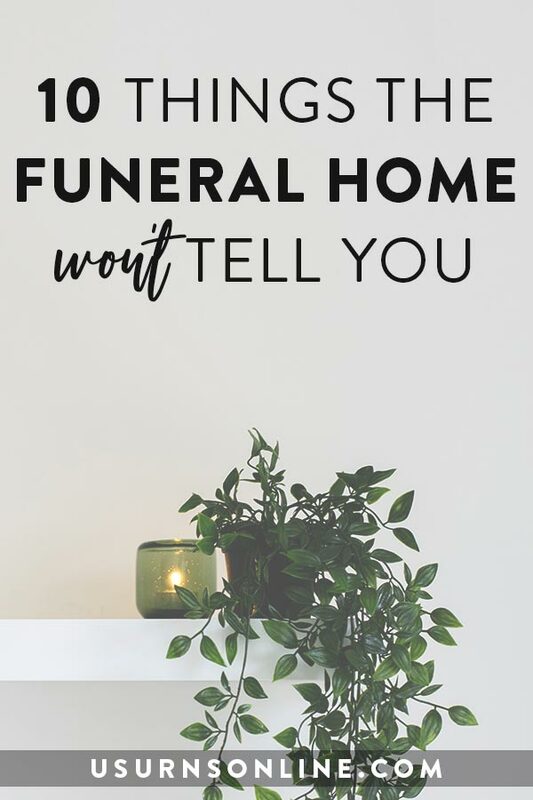 Just be aware that some of the people involved may not be funeral home staff. 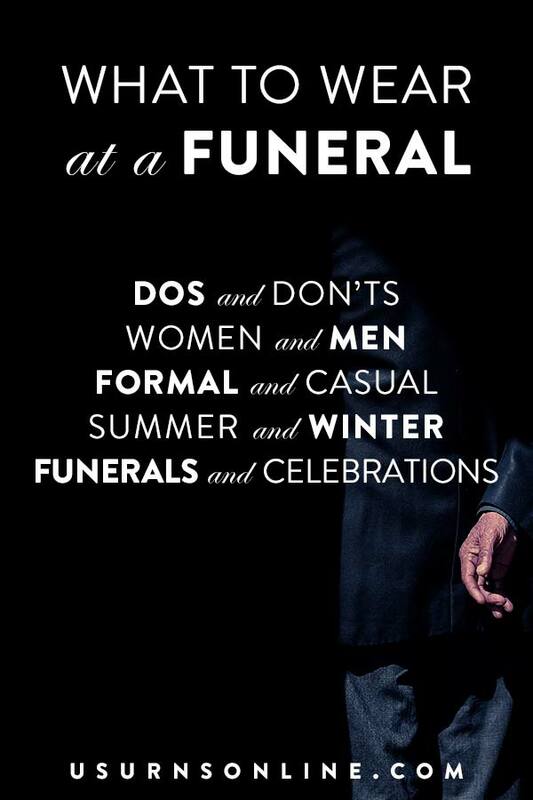 For instance, limo drivers, pall bearers, musicians, florists, makeup artists, and others (more on this below) may not be directly employed by the funeral home. For most of these service professionals, a small gratuity of about 15% is expected and appreciated. Most ministers and clergy do not charge for their service to the family in the days before, surrounding, and after the death of a loved one. It is also considered inappropriate to ask if they “charge” for conducting a funeral service. Often, clergy members have a heart to serve those in need. No matter how rich or poor a person is, the minister will offer their services free of charge. However, it is typical to “honor” the minister’s time, effort, and special care regarding the funeral by giving them an honorarium. A customary amount is in the range of $50 to $300, though you may go above or below that depending on your circumstances. If you can’t afford an honorarium, tell the minister in advance. In any event, be sure to send a heartfelt thank-you note after the service. Some ministers have a standard honorarium fee, and if they do they will mention it to you. Others waive the fee for everyone, while still others decline any fee or gratuity from members of their church or congregation. Often the musicians at a funeral are talented friends and relatives or volunteers from the church community. If they are providing their services at no charge, it is customary to provide a generous tip in the range of $50-100 per musician. When hiring musicians, their fee covers their service. However, as with most event musicians, they will no doubt perform with grace and expertise and even accommodate requests from the family. So it is customary to show your appreciation with a gratuity in the range of 10-20% of their fee. Flower deliveries will probably happen regularly as friends and family members send their condolences. The delivery person relies on tips for much of their income, so it is expected that you have a small gratuity for each flower delivery. A tip of $2-5 per delivery is appropriate. Be sure to keep some single dollar bills on hand to tip delivery drivers. 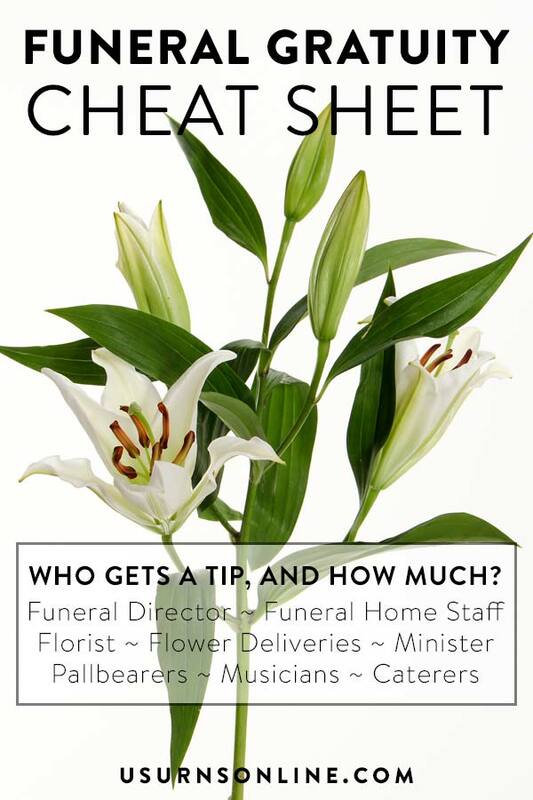 If you have hired a professional florist for the funeral, a gratuity of 10-20% is a great way to show your appreciation. Often a florist will spend plenty of time preparing, delivering, and arranging the flowers to make the funeral look gorgeous. A tip for all this work is highly appropriate. Gratuities for food services are pretty standard across the board, so this is familiar territory. You should tip the caterers about 15-20% of the total bill, to be shared among the staff. Professional drivers should be tipped about 10-15% in addition to the fare. It is customary to do so, but not required. Some limousine or transportation services include a gratuity on their bill as part of the cost, so make sure to review the details of your arrangement ahead of time. To be chosen as a pallbearer at a funeral is a sign of honor and respect. Typically this role is reserved for the decedent’s closest friends and family members. If that is the case, no tip or payment is required. 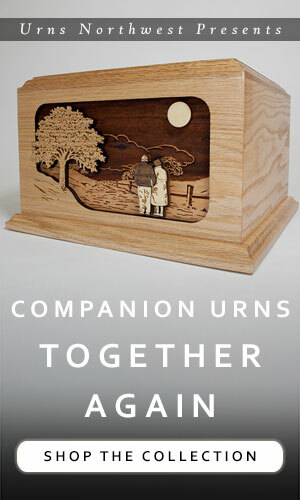 However, sometimes there are occasions where you need to hire pallbearers. Often the funeral home staff members will step in to fulfill this role. As noted above, there is no need to tip the funeral home staff. If the pallbearers are not funeral home staff and you are still unsure about whether or not to tip, ask the funeral director. There is no established protocol but a gratuity of $5-20 for non-funeral-home-staff pallbearers would be an appreciated gesture. Here is the quick lowdown on funeral gratuities. Funeral director: No tip. A thank-you note is appreciated, perhaps a small gift like a plant or cookies. Funeral home staff: No tip. Same as funeral director. Minister or officiant: No tip if charged a fee; if no fee, $50-300 is an appropriate honorarium. Musicians: 15-20% gratuity if hired; if volunteers, a tip of $50-100 each is appropriate. Florist: 10-20% of the bill. 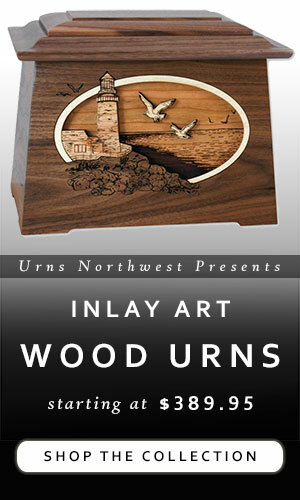 Check invoice first to see if gratuity is included. Caterers: 15-20% of the bill. Check invoice first to see if gratuity is included. Funeral procession drivers: 10-15% of the bill. Check invoice first to see if gratuity is included. Pallbearers: Typically no tip. If hired, $5-20 each is appropriate. 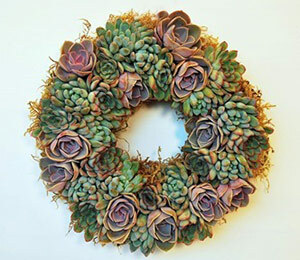 Next post: Bouqs Review: Should I send Bouqs flowers as sympathy flowers?